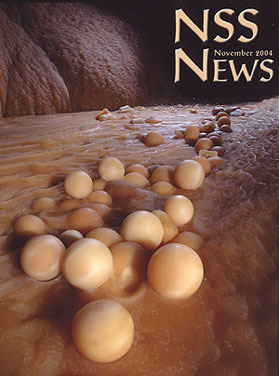 The NSS News is our monthly publication sent to all members of the National Speleological Society. Typical issues have 28 to 36 pages in full color, offset printed on coated paper with a laminated cover. All the material is submitted by the membership; no one is paid for use of their materials. Feature articles typically include cave exploration, cave conservation, cave history, or cave science. 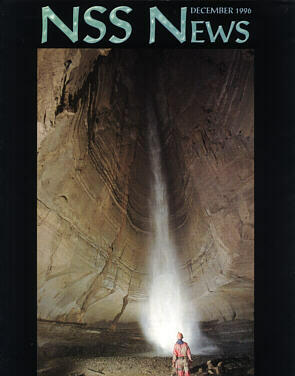 Regular columns include Technology (reviews and discussion of cave gear, high-tech and otherwise), In the Media summaries of cave-related articles in the popular press, Underground Update (summaries of information in Grotto and Regional publications), Spelean Spotlight (interviews with prominent cavers), International Exploration, News and Notes, Society News, Safety & Techniques, and the Salon Gallery, reproducing winners from our annual slide and print competitions. Each March or April there is a special Cave Conservation issue and each fall an issue that highlights that summer's convention. Our August issues now present annual compilations of caving accidents and near-accidents, with analyses of what went wrong. Formerly this was a separate issue called American Caving Accidents. Members, the editor is always looking for material. Check out the style guidelines below or e-mail the editor at nssnews@caves.org. The News is sent automatically each month to current NSS members (except for Basic Members). Subscriptions are available for those who don't wish to join the Society, or institutions such as libraries. To order a subscription to the NSS News with a credit card, you can use the online form, or if you need to send a check, print out the PDF form, fill it out, and mail it to the NSS with your check. Information about the NSS News, how to submit stuff, content, etc. A page with links to material that supplements the printed NSS News, such as maps, videos, documents too long to include, etc. in Adobe Acrobat PDF format (6.7 mb). If you need the Acrobat reader, you can download it for free at the Adobe website.